Malaysia comprises two regions separated by the South China Sea: Peninsular Malaysia and Malaysian Borneo. Both have some excellent diving. Peninsular Malaysia is immediately south of Thailand - Tioman Island is off its East coast and Kuala Lumpa is found on its West coast. Malaysian Borneo is home to Sipadan - one of the best diving areas in the world - in the state of Sabah. You can dive around Malaysian Borneo all year round. The best time to dive the west coast (Layang Layang or Tunku Abdul Rahman Marine Park for example) is between March and May. For Sipadan off the east coast the most settled weather is from April to December. For Peninsula Malaysia the best time is from February to November - from December to March is the rainy season. The water is always warm and between 27 oC and 31 oC. Malaysia forms an important part of the coral triangle - one of the most biodiverse areas in the world. It has more sea area than it does land. In 2016 the Sabah State Government created the country's largest marine park off the coast of Northern Borneo - the Tun Mustapha Marine Park. According to the WWF, it will be an IUCN � International Union for Conservation of Nature - Category VI Park where sustainable uses are still allowed and local communities living within it are able to continue their activities within designated zones. The productive fishing grounds in the area support more than 80,000 people in coastal and island communities, generating around 100 tonnes of fish catch each day. The marine park will protect almost 1 million hectares of coral reef, mangrove, seagrass and more than 50 islands. Browse below to read divers' comments and see which dive centres have received the "5 fish" rating. You can rate a diving centre you dived with here. Visit many top diving destinations in Malaysia, including Sipadan, Mabul, Kapalai islands; Layang-Layang; Lankayan Island; and Darvel Bay Semporna Archipelago. 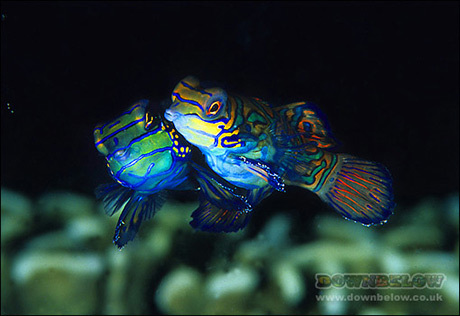 Order: Callionymidae - Dragonets. Smaller female with a belly full of egg. Downbelow are a PADI 5-Star CDC Centre with two dive centres based within the Tunku Abdul Rahman Park (TARP) just 10 minutes by boat from Kota Kinabalu. One on Gaya Island, surrounded by lush tropical jungle and vibrant dive sites right on the doorstep. The other based on Manukan Island where they offer stay and dive packages. They provide complete SCUBA diver training courses from Discover SCUBA through to IDC Staff Instructor. Daily reef and wreck diving trips along Sabah's West Coast & the Tunku Abdul Rahman Park. Downbelow also offer diving in Sipadan, Kapalai, Mabul, Lankayan, Layang Layang & Pulau Tiga (Survivor Island). Excursions from their island-based dive station in the Tunku Abdul Rahman marine park (TARP) also include guided snorkelling, sea kayaking, jungle trekking and through their Adventure Travel Centre, a wide range of accommodation and land-based tours in Sabah. Downbelow's facilities can accommodate individuals or large groups for fun activities, half or full-day excursions or multi-day Team Building Events. They have a Dive Shop on the UK mainland. "I had the most amazing time on Palau Guya diving on the coral reef. Everyone at Dive Downbelow has such a high standard of knowledge on both diving and what we can find under the surface. I visited with some other students on a study trip and all of the instructors were so professional but also really fun! Its inspiring how much they also care for their environment, clearing the small beach every day after the tide goes out and leaves bags upon bags on rubbish, and also always keeping an eye out for litter and snagged nets under the surface which are always immediately removed with the greatest care and precision. The atmosphere of the dive centre is like no other. The fact that it can only be accessed by boat should be proof enough that you are about to enter an ocean paradise. A pristine, secluded area on the beach and also green space with the jungle providing a beautiful backdrop, will have you never wanting to leave. I highly recommend a visit to the guys on Palau Guya!" "Have been diving with them in TARP several times + have been on a tour there arranged for Sipadan Lankayan. As well as a wildlife adventure fixed by them for Kinabatang River.ALL ARRANGEMENTS HAVE BEEN FAB! That is why we are always returning - appreciate they way of doing, but especially how they respect the nature! " "Two friends and I have just spent a fantastic 4 days with the team at Downbelow, and I can't recommend them highly enough. We took part in the PADI Open Water Diver course, which was superb. Our instructor (Victor) was excellent - his instructions were always clear, we never felt rushed, and I always felt we were in good hands! The course involved 5 confined dives and 4 open water dives, and we also had time for 2 extra open water dives at the end of the course (for an extra fee). The location itself was beautiful - the paradise Gaya Island offers hikes etc. too if you're so inclined, but we spent all of our time in the water admiring the beautiful aquatic life! The centre itself has toilets and showers; water, tea, coffee and biscuits available throughout the day; a small kiosk to buy other drinks, crisps, chocolate; and the lunch provided each day was delicious. Everyone at Downbelow is friendly, helpful and so enthusiastic about diving, it was a pleasure to be around them. We were made very welcome in what is clearly a very well-run operator. The fee included transfer to and from our hotel each day, lunch each day, and the course itself - excellent value for money. I would absolutely dive with them again! This was my first diving experience but I can't imagine doing it in a better place or with a better organisation! Thanks Downbelow! " "Definitely would dive with them again. " "I will return and dive with them again. Everything was extrememly satisfactory and so easy to dive with them. Organisation was good. Safety was never a concern. Nothing was too much trouble. Very good value for money. Better (than other places) although vis was not good at times. " "Our trip was very successful and we enjoyed a lot. All the arrangements were well managed and all went according to the plan. Downbelow team in the dive resort was professional and very friendly. Also the weather was good, some rain but that is normal and expected during that season. " 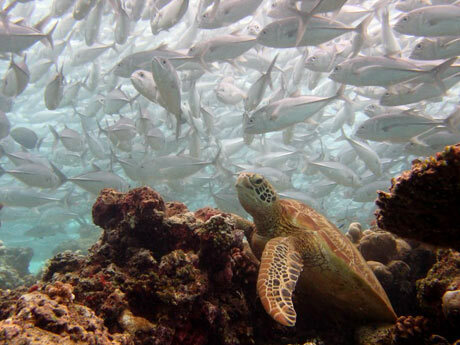 All dive operators and resorts have had to leave the island of Sipadan on environmental grounds. A good place to base yourself for diving here is Semporna or Mabul. On 14 August 2018, the Sipadan permit conservation fee of MYR 40.00 rose to MYR 140.00 per person per day. The cost with tax will be MYR 148.40. This is equivalent to around 40 USD, 32 Euro or �27. Only 120 permits are issued each day. The permits are shared by 12 dive operators, who have to tell the Sabah Parks authority the details of their divers. Priority is generally given to divers who stay the longest at the diving resort and who book the earliest. A beautiful peaceful, paradise island resort with PADI Dive Centre, dive packages available with luxury accommodation. Enjoy diving the 6 nearby islands surrounding Pom Pom Island, amazing macro plus beautiful coral fish and turtles. Resort has range of luxury detached beach and water villas constructed for every comfort. Packages include 3 meals per day plus snacks, juices, coffee and tea etc in our famous traditional Malaysian Restaurant. Contact us for more details and prices. Dive The World offers Malaysia resort diving in Sipadan, Mabul, Kapalai, Layang Layang and Lankayan Island, and also PADI dive courses in Mabul and Kota Kinabalu. "Sipadan Scuba is a PADI 5-star IDC & National Geographic Dive Denter S-6528, the first and only PADI 5 Star Instructor Development Center in Semporna, Sabah, Malaysia and the first National Geographic Dive Center in Borneo. ."
"Scuba Junkie was the ideal place to dive, if you like having good condition equipment and dedicated and passionate staff, who love to spend time at the end of the day going over all the incredible marine life that you see during the day!!! I have just recently come back from spending my honeymoon at Scuba Junkies Mabul Beach Resort, and I have to say it was the most perfect honeymoon a woman could ask for. The amount of detail and care that the staff at Scuba junkie took to make sure our trip was memorable was amazing, the first day we arrived, our bed had been decorated with petals! The managers that run the place, Carys and Rohan are so friendly and organised, and were always willing to help with any questions or requests we had. We were lucky enough to be there for one of the Shark presentation talks... I never knew even a quarter of things we learnt! If you go here, you must ask about the Turtle Hatchery, on our last night the eggs hatched and we got to watch hundreds of baby green turtles make their way to the water!!!!! Cost was very reasonable, the room included all 3 meals, unlimited tea, coffee, hot chocolate and water... Would have to say that the cocktails are a must though! Scuba Junkie spends a lot of time promoting awareness about sharks and turtles, and I noticed they have a huge area dedicated for rubbish collection, my husband and I had a great afternoon with the staff taking part in one of the organised beach and reef cleans. I think in this day and age its important for dive resorts to look after the area they are in. One of the best places to stay and dive, for safety, reliability and fun, theres no one better than Scuba Junkie!!! Thank you for making our stay so unforgettable! " "Excellent, professional outfit, would dive with them again without doubt. Did 21 dives around Sipadan with them in October 2005 and had a great time." "These guys were brilliant! Myself and the missus did our PADIs a year ago and so we booked for a refresher dive with Scuba Junkies before heading off for a posh dive resort, but after a fantastic day with Scuba Junkies we really wished we'd booked with them instead. The equipment was great and it was a great three dives, and their rates were very reasonable, but what really made it for us was the brilliant atmosphere on the dive boat. We could have easily spent a week in their company. Can't recommend them enough." "Scuba Junkies is definitely one of the best dive operators I've ever come across. Took my Open Water course with them and they've got me hooked! My 2 instructors Tino from Germany and Cle from South Africa were definitely experienced and enthusiastic. 3 cheers to the various divemasters too! Very warm, friendly and interested! It really differs from those big so called 'professional' dive companies you find simply processing out schools of fresh-eyed divers for the sake of profits! I've even come to the point of putting up a big Billboard in the Backpackers hostel that I run in tribute to them, definitely recommending them to every single diver that that comes thru my door. Definite thumbs up to Scuba Junkie. Planning to do my Divemaster there the end of the year!!" "I personally would NOT dive or take any course with this company. Having undertaken my Divemaster course with them their standards and services were below expectations. They can not organize a piss up in a brewery. As for booking in advance, Ha, the amount of times they gave the same excuse that they had not received the information. This left many customers waiting an extra day or two to dive. As for the comment of hanging around in the evening it is the only operator I know that makes all it's customers go back to try their gear on! Safety and management are very negelected and this is very worrying when your divemaster is really a Trainee! The diving is excellent but only use this outfit if you are looking for assistance or have little confidence in diving on your own. Lives depend on it so be at your own risk! Check out the other operators and don't fall for the trick SJs use on customers by saying that the other dive shops promise to go to Sipadan then go some where else. They all get a certain number of licences, scuba junkies the least!!!" "I will not dive with them again! SJ just look to $$. We had a really bad experience and so did many other people. They promise you diving in Sipadan and they change your dates as they want to dive in Mabul ( very very poor, the first 3 meters is green water and really little life). We booked for 2 dives in Sipadan 2 months in advanced and confirmed by e-mail by Ric, but we found they haven't booked the permission to dive there for us, we had to dive with a different name (people had to snorkel, there is a different fee between snorkel and dive in Sipadan). Then they decided to cancel our dive in Sipadan, we had to dive in Mabul, the accommodation they offer in Mabul is extremely poor with broken beds, compressor working all day just close to the longhouse (impossible to relax), really bad food...... at a different price than confirmed to us by Ric by mail. We got no apology, no other solutions, and as they had our passport we must pay even if they're wrong (that is incredible, the only dive center in the world that keeps your passport until payment). The treatment was really poor and they're not so cheap as they say, there are a lot of dive centers with the same price or cheaper than them. 3 dives in Sipadan+equipment+fee (that you pay but they don't pay to the park) are 340 ringit+ sleep, meals.... etc. Scuba Junkie when is full to dive in Sipadan try to convince divers to dive in Mabul, where diving is really poor, so before going with them, try to contact other dive centers like Sipadan Scuba or Uncle Chang or others.....there are a lot. " "Definitely worth checking out Semporna as a base for diving Sipadan - especially as Sipadan has now been cleared of the operators on environmental grounds - it is likely that a few more local operators will set up in Semporna. Using Semporna as a base firstly has the advantage of economy - we paid around Rm300 each for 3 boat dives, plus accommodation (we stayed at the pretty basic, but ok Dragon Inn) is virtually free. In addition, you have the option of hanging out in Semporna vs. being stuck on Mabul in the evening and can take a rest day without feeling guilty about all the money you've shelled out. We spent a day diving around Sibuan with another operator and then two days diving at Sipadan/Mabul with Scuba Junkies. They were enthusiastic, professional and had very new gear. There was a maximum of 12 divers on board. Would definitely recommend them - they're situated between the waterfront area where all the stilt hotels are and the market. The comment about people getting kidnapped from Sipadan is highly alarmist. Whilst it's a true story, you're probably in greater danger in Paris or London-- we saw several police/military boats in the area patrolling for illegal fishing, smuggling, pirates etc." "The newest operator in the area but with two instructors, Tino and Ric, that have lived and dived in the area for a number of years working for another dive company. Their equipment is all brand new and regularly serviced. They operate around Sipadan, Mabul, Kapalai and the other Semporna Bay Islands. All worth checking out for the varied marine life available. As an Instructor who has dived with them prior to them setting up on their own I can highly recommend them as highly knowledgeable, passionate divers and very professional. If Tino and Ric are unable to fit you in they will give you the best advice on who to try next." "Having dived with Scuba Junkie in March of this year I can thoroughly recomend them to anyone interested in having fun and seeing as many of the great species that Sipadan and Mabul has to offer. I dived with them for one week and felt like a part of the crew by the end of it! Another great thing is the dive shop is pretty much the only place open after 9pm so everyone just hangs out there for a drink!They have recently opened up a hotel/backpackers where i was staying in a dorm room for 10 ringgit a night! My room had aircon and was lovely and clean - quite a change from other places I've stayed in while in Malaysia! Ten out of ten guys!" "I do NOT recommend diving with Uncle Changs to beginners! In fact, I don't recommend Uncle Changs to anyone! Despite the friendly and helpful reception staff and the great location on Mabul Island this turned out to be our worst diving experience so far. The lack of responsibility taken by the instructors was shocking and the kit was absolutely awful. Sadly you are limited by who has passes to Sipaden when you dive in this area. All I can suggest is to be sure to book with a different company well in advance." "Uncle Chang's was a great experience. New equipment and boat with quality staff on Mabul island. It can't be beat in terms of atmosphere and quality. Highly recommended. Better than any other place I dove in south east asia." "Uncle Chang's Mabul Backpackers is simply the best. Diving at Sipadan at backpacker prices is crazy (my only problem was some equipment was a little old, but perfectly safe) they are really friendly. I could always get Sipadan permits etc as Uncle is the only true local Malay operator, great stuff, will go again if I'm lucky enough to be in Borneo again. Since I've been staying there they have, for the 1st time in their 8 year existence, got a website....ye ha!" "I've just returned from Semporna- Sipadan and Mabul. I completed my PADI advanced with Scuba junkies, but was unimpressed with their service, so on recommendation I decided to complete a few fun dives with Uncle Chang's on Mabul Island. I can definitely recommend Uncle's for both the diving, the quality of staff and the atmosphere. I felt at home and I learnt more in 4 dives with Uncle's then any where else. I will definitely be returning to this little slice of paradise!" "It was certainly an experience diving Mabul/Sipadan with U.C.! The equipment was very old and unreliable, not a problem for experienced divers.....NEWBIES BEWARE! Staff were friendly but it doesn't matter how experienced a divemaster is, groups of 12+ people is a problem waiting to happen. The free food is ok but the rum drinking at night might make some nervous about doing 3 deep dives the next day. The boats are falling to bits, but just work. Make sure you're not inexperienced as a diver. Large groups of divers with tatty old equipment panic...(it happened on 2 out of the 9 dives with Uncle Chang)"
"A group of six of us spent six awesome days diving Sipadan from our base on Mabul courtesy of Uncle Chang. The Divemasters and instructors were simply superb, taking care of everything for us, and Mabul backpackers lodge was simple yet outstanding. It has a real sense of community. Would recommend to anyone." "Great place to stay at uncle changs place at mabul island. However the equipment is poor! Old, leaking material and the bcd was sometimes not properly working (air in knob did not release after pressing, so I was inflated and went straight to the surface!) Even the boat was held together with bolds since the back board on which the engine was fixed had been broken off in the past. The price for diving is the same compared to other companies. The hostel although simple is rather cheap and of great value specially because of the friendly ambiance, people and music in the evenings. Mabul Island is a great place to be (cheap, simple and very friendly)." "I checked all operators in Sepmorna who were open for business and decided to try Uncle Chang. I stayed with him for the duration of my holiday. I delivered my equiptment on Monday morning. Each day it was taken to the boat; tank changes were made and it was then taken to the offices where it was rinsed, dried and stored until the next day. On my final day it was delivered to my hotel. All dives were accompanied by two highly experienced instructors or one instructor and a divemaster. One instructor had over 6000 logged dives and the other was not far behind. The number of paying guest divers in the boat never exceeded 5 and all staff involved were justifiably proud of the friendly and very competent service which they provided. I have dived in many places in the world and know that it will be hard to find better service. This is a local business, owned and run by locals and is the longest established in the area. It is also the most conveniently positioned. Prices were very competitive and food was good too! Freshly grilled fish, chicken, fresh fruit and several interesting local delights. A dvd of some of my dives was available and will be a constant reminder that I must return as soon as possible. " "Hey! Have to say something really nice about Uncle Chang... Heard that some others had bad experience. I booked my dives with him together with a school of students from Singapore in spring 2004. He gave us extremely good prices and we had no problem with the equipment at all! He also collected us from bus station and set us up on the boat, was awesome. He's one of the old smaller local vendors that is not running it like a industry! (And seriously, he don't want to either.) Uncle Chang for president! And yes the diving is great and Barracuda point a must. "Great people to deal with: very helpful. The other companies are very hard sellers and run the other operators down saying they are the best which I did not like. Uncle Chang I would use again." "Hey Uncle Chang was simply great... In fact he has real caring Dive Masters who really track you every minute of the journey. In fact his ratio is like 2 Divemasters to a Group of 4. I have never seen a better ratio anywhere. And they are ALWAYS watching over you. I was particularly impressed with Mr Armando Gelan (MANDO) who really made sure we had a fabulous time. I shall MOST definately recommend Uncle Chang to everybody... Besides that Uncle Chang also throws great parties at night - and it is dinner and people and music with a most unconventional drum... Love it... "
"Uncle Chang's diving organisation was brilliant for us. We did 8 dives with them for a rediculously good price and he was the most generous and friendly host possibly imaginable. I have every faith in Uncle Chang, so much so we are going back to dive with him this month (nov 05). As someone mentioned previously, great parties after a superb days diving." "We stayed on the Mabul Island with Ungle Changs divers which was excellent." MYR 360.00 3 Dives in Sipadan / Mabul." "I dived with them last month. Very professional, local guide with 5 years in that area. The homestay is clean with very friendly staff. I'm sure I will back again. "Would I dive with them again - no bloody way!! Unprofessional, untrained amateurs. The worst dive operator I've ever been with. Their equipment was life threatening - really awful. "Sipadan Dive Resort were not very tolerant of inexperienced divers. They do get more accepting as you dive with them. Cost was fairly ok with unlimited shore dives." "Excellent dive resort - would take issue with previous comments about attitude. If you go to Sipadan as an inexperienced diver - it's your own fault, read about the place before you go - common sense! The resort, although basic, had a great friendly feel to it - we were very happy there. Diving was excellent - staying at resort enabled us to do several shore dives in addition to the boat dives - diving the drop-off from the shore was awesome every time. Was up at 6 am almost every day to get as much diving in as my computer would allow! Good value for money." Tioman is the third largest Malayasian island, off the east coast of the peninsula. The island is about 38 by 19 km. There is a road which extends about 3-4 km past the airstrip and ferry terminal and a couple of km either side. It connects the villages of Tekek and Juara, however all other villages are accessible only be ferry boat. The coast is a marine park area with a limit of 2 nautical miles offshore for commercial fishing. The water is warm, from 27 to 29 oC. There is only 1 ATM on the island, so it is best to bring some cash with you and check with your resort and dive centre is they accept cards as many places do not. Exchange currency before you get to the island (in Mersing) as you won't get a good exchange rate on Tioman. There is no decompression chamber on Tioman Island: the nearest is in Singapore. Make sure you have adequate travel insurance for diving. The Tioman season runs from early February to November, the out of season time is associated with unpredicatable weather during the monsoon. See also our article on diving Tioman and the Tioman Dive Site page. Provide a full range of PADI courses. The owner/manager is Rosie Cotton. 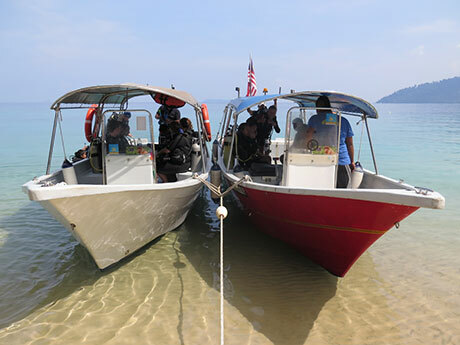 Now have two dive centres on Tioman. One at the Swiss Cottage Resort and the other at The Panuba Inn Resort which is set on its own beach. For more on the Tioman Dive Centre, and accommodation options, read our Tioman report . "Last time I visited Tioman was in August last year. I stayed in Tioman dive resort, which belongs to BJ diving centre in ABC. Compared with Tekek, ABC is a smaller village with less people. The staff of BJ are really friendly and helpful. We stayed in a standard room of their resort, which is right behind the dive shop. It is well finishing with clean maintain. There is a bar at sea side, which is two minutes from our room. It costs around 300rm, which is a little bit expensive compare to the rooms around, as for it provides better service and environment. Cheaper rooms can be found around the dive shop, as low as 40rm per night. " "I did my Rescue with them - very professional instructors and cheap, some 30 US per dive but I did 10 dives so I paid only 22 US per dive. I had tons of fun with their dive team and will surely go back next year." Malaysia Sea Sports. All ages, all sizes, all levels. 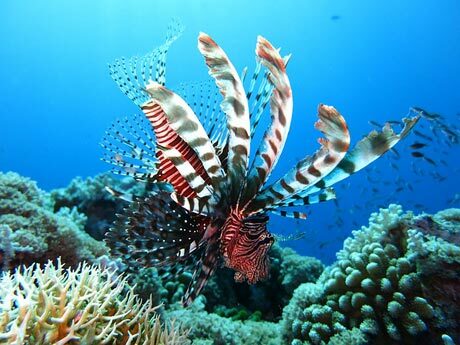 "Not many areas offer scuba-diving locations as breath-taking as at Malaysia Sea Sports. From Tioman, and its sister islands Dayang and Aur, to the relatively unknown yet idyllic islands of Simbilang and 'World Atlas of Coral Reefs' member Seri Buat, Malaysia Sea Sports boasts dozens of unique dive locations that will leave you speechless." Scuba Schools International Dive Centre. 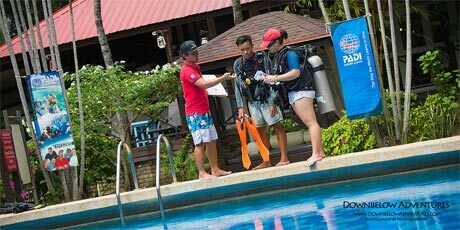 "Mr Dive Malaysia is a freelance PADI Instructor working close with 2 of the resorts on the Island , discerning discrimination on your behalf , ie: you will Pay the same price as a Malaysian will pay, If any company asks for your passport info as you ask for a quote they are going to charge you DOUBLE or TRIPLE . There are NO double standards with Mr Dive Malaysia. Accom is basic but clean , the food is good and the service is freindly.. and the diving ??? you will not complain thats for sure .. Happy Travelling." "I would strongly recommend Scuba Dynamics for any divers planning to explore diving in the South East Asia region. My husband and I found out about Scuba Dynamics from a friend whom had just got back from Malaysia. Scuba Dynamics designed a few dive trips for us during our short 3 weeks holiday in Asia. Being a one-stop-dive center, they have made us very happy by organizing wonderful trips to Puerto Gallera in the Philippines, Perhentian Islands on the East Coast of Malaysia as well as the famous Sipadan in East Malaysia. The trips were planned out very well by Scuba Dynamics and their recommendations and advice were very much appreciated. " Founded in September 2004. They aim to make add divers feel welcome and above all, to have safe fun while SCUBA diving. 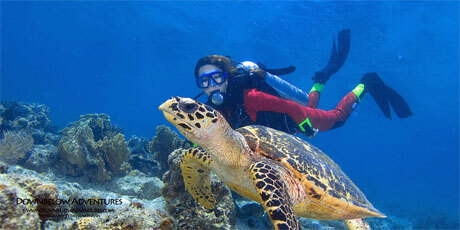 Offer PADI diving courses, snorkelling trips and underwater videography. "Dive Station: low value for money ! This operator is not to be trusted. Takes huge commission on hotels and dives hidden behind opaque invoicing. AVOID ! Run trips to Sipadan. This PADI centre is in Bangi, just outside Kuala Lumpur. "Responsible instructors, I took my advance Open water with them. They been awarded as ECO operator by PADI. " Offer day trips to Pulau Payar Marine Park ; short holidays to Perhentian and Lang Tengah, South China Sea; longer dive holidays in both East and West Malaysia, plus further afield like the Maldives, Indonesia, Phillipines, Thailand, Seychelles, Mauritius and Papua New Guinea. "Friendly, efficient service, reasonable prices. Our Malaysian dive master was excellent, very professional and full of enthusiasm." Downbelow are a PADI 5-Star IDC Dive & Adventure Centre with our dive station based on Gaya island, just 10 minutes by boat from Kota Kinabalu, surrounded by lush tropical jungle and vibrant dive sites right on their doorstep. They provide complete SCUBA diver training courses from Discover SCUBA through to IDC Staff Instructor. Daily reef and wreck diving trips along Sabah's West Coast & the Tunku Abdul Rahman Park. Downbelow also offer diving in Sipadan, Kapalai, Mabul, Lankayan, Layang Layang & Pulau Tiga (Survivor Island). Excursions from their island-based dive station in the Tunku Abdul Rahman (TAR) marine park also include guided snorkelling, sea kayaking, jungle trekking and through our Adventure Travel Centre, a wide range of accommodation and land-based tours in Sabah. "Have been diving with them in TARP several times + have been on a tourtheir arranged for Sipadan Lankayan. As well as a wildlife adventurefixed by them for Kinabatang River.ALL ARRANGEMENTS HAVE BEEN FAB! That is why we are always returning - appreciate they way of doing, but especially how they respect the nature! " Chat with us: click on 'chat' on our web site (live chat service during office hours). Skype chat available upon request. Visit our office (advance notice required): F-G-1 Plaza Tanjung Aru, Jalan Mat Salleh, 88100 Kota Kinabalu, Sabah, Malaysia. "Borneo Dream is an authorised PADI, SDI, TDI, IANTD and BSAC Dive Operator, as well as a licensed Tour Operator, based in Kota Kinabalu, Sabah, Borneo. We aim to cater for all levels of diving knowledge and experience - from non divers all the way through to technical diver. We offer the widest choice of diving day trips from Kota Kinabalu with dive trips to Tunku Abdul Rahman Marine Park (TARP), wreck diving, Pulau Tiga, Mayne Rock and Mantanani. Non-Divers can join snorkelling trips to Tunku Abdul Rahman Marine Park, Mantanani and Pulau Tiga. We can also arrange for you to stay at a choice of Resorts at Sipadan, Mabul, Layang Layang or Lankayan - some of the best dive locations in the world. We are the first Dive Operator to provide FREE Nitrox, Enriched Air, for certified PADI Enriched Air divers when diving with Borneo Dream on any of our scuba diving trips. We are also able to provide Nitrox up to 100% Oxygen, Trimix and Twin sets. This makes Borneo Dream a great choice for Technical divers visiting Kota Kinabalu, Sabah. As a licensed Tour Operator we can arrange hotel accommodation and land trips for you too. Just let us know what interests you, and how much you want to spend, we can then help create your dream trip itinerary for your holiday in Sabah, Borneo, Malaysia. Just contact the Dream Team for help with your holiday to Sabah!" "I have just dived with Borneo Dream during my holiday to Kota Kinabalu in Sabah. They were excellent from the beginning to the end of the diving trip - a large well equipped catamaran for a dive boat, making the effort to take you to the nicest dive sites on the day with good vis (other operators didn't). Friendly and knowledgable dive team, a great approach to safety and good fun. I would highly recommend them for anybody going diving in Kota Kinabalu." 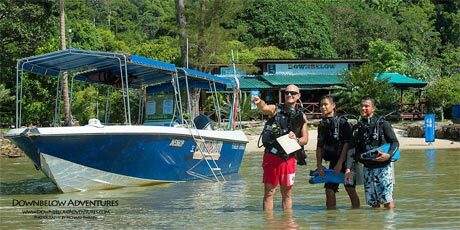 "We dived two times with Borneo Dream and plan to go back, very friendly and very safe way of practising. Professional and friendly, Borneo Dream team helped us to discover the different bottom of the area. From the wrecks around KK to Sipadan every minute was an enjoyment." "1st time diving and tried PADI Discovery Scuba Diving down to 12meter. It was great. Free from noise, just hear your own breathing in the calm water. No one require doing any talking and just reading hand signal to communicate. The water world is really fascinating. Swim around queuing fishes, saw the sea cucumber moving slowly around, and look at the aquatic live. It was already 4PM when I was signalled to return to surface. Time flew without even realising it. great experience and thinking to continue PADI Open Water Diver Course!" "I would highly recommend Borneo Dream to anyone who wishes to explore the wonderful array of fish, and corals, that lie beneath the sea and who want to become a qualified PADI diver. Safety always comes first with Borneo Dream, which before meeting them was my main concern as I was a bit nervous at first. I was soon at ease though as they are a very experienced and proffessional team of people who's goal is seeing you safely through your PADI while teaching you the skills for safe diving and importantly having fun, thus enabling me to make the most of and enjoy this wonderful experience! " "We completed our open water referral with BorneoDream over two days. We had an amazing time and found them to be totally professional with good equipment and knowledgeable instructors, who put us at ease and ensured we had a good time. Excellent dive boat captain (Captain Merali) and good onboard facilities. 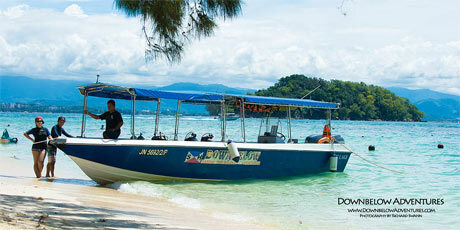 We would recommend BorneoDream to any new or experienced divers wanting to dive in Sabah Borneo. We hope to go back and dive again with them in the future. " You can dive Layang Layang from a liveaboard or resort. The diving here features both pelagics like hammerhead sharks and beautiful macro dives. 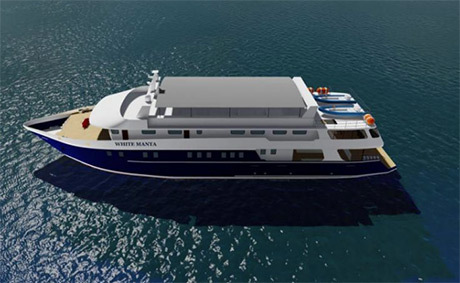 Brand new liveaboard has her maiden voyage in April 2019. Accommodates up to 30 divers in 14 cabins. Nitrox on board and four tenders to take divers to the dive sites. "Excellent resort, We were well looked after and the food was outstanding and plentyful. My only complaint is that the tanks were consistently hot filled so they only gave us about 180BAR. If we got one with 170 they would change it! No Nitrox, Light fills, I never had a full tank [200 BAR or 3000 PSI] the whole time I was there for 6 days. Other than that no complaints. I would definitely dive there again as the marine life is outstanding, As good as Palau and better if anything than Sipadan.."
What connection do you have to the dive operator?